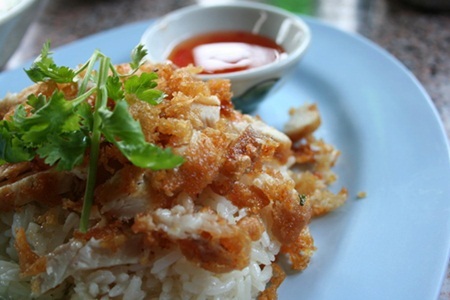 Previously, I had already presented you with the Khao Man Gai (chicken with rice) recipe. And then I got a comment asking about how to make Khao Man Gai Tod (Fried Chicken with Rice). Therefore, I went to search for the recipe for you all to try, to make and to eat. Ingredients and how to make Khao Man Gai Tod (Fried Chicken with Rice) are simple as follows. 1. Wash the chicken breasts with water thoroughly. If the chicken is very thick, then cut chicken into pieces lengthwise about 1.5 – 2 cm thick and then put them in a mixing bowl. 2. Add soy sauce, seasoning sauce, oyster sauce, sugar, pepper, garlic powder, coriander powder, and red pepper into the mixing bowl. Mix well. Then put the marinated chicken in the fridge for an hour. If you have more time you can let it sit overnight (the mixture will absorb into the meat more). 3. Crack the egg into a bowl, then beat to rise. Before frying, dredge the marinated chicken in the all purpose flour. Lightly pat the excess flour off. Then dip the chicken into the beaten egg. Finally dredge the breasts in the breadcrumbs thoroughly. 4. Place the wok with oil in it over medium heat. Wait until the oil is hot enough to put the chicken down to fry. Fry about 10-14 minutes until chicken is cooked, browned and floating. Then take them out and drain the oil. Wait to serve with rice and the sauce. 4 large red Capsicum frutescens (Solanaceae) or Prik Chee Fah in Thai (will be dividing them into 2 parts: 3 of the chilies will be cut lengthwise along the grain and use the spoon to scrape the seeds out. The remaining one will be used as the whole chili to provide moderate spiciness). 1. Put the chili, garlic, vinegar, water garlic pickled, and salt into the blender. Then blend until everything is mixed well and fine. 2. Pour the blended ingredients into a pot and place it on the low heat. Simmer to boil. Then add sugar, stir until dissolve and simmer for another 10 minutes to allow water to evaporate. Then will get the sauce that has a stronger taste and is a bit more sticky. 3. Turn off the power. Lift it down and let it cool. Chop the fried chicken into bite sized pieces and on top of the rice. 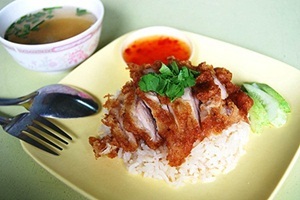 (How to make the rice, you can go and visit the Chicken and Rice page from previously). Garnish with coriander leaves. 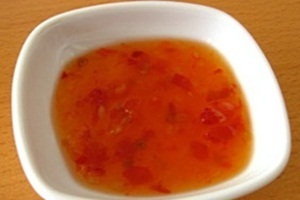 Serve with cucumber obliquely sliced, the sauce and soup.